The northeast corner of Yonge and Eglinton is the incredible location for E Condos, Bazis Inc.’s new condominium coming soon to offer the pinnacle of modern urban living. Not only is this condominium surrounded by stores, cafés, shopping and other amenities, but also it will offer direct underground access to the other three Yonge-Eglinton corners, PLUS the Yonge subway and Eglinton’s Light Rapid Transit system. Talk about convenience! And how is this for unbeatable value – suites start in the low-$300,000s in this condominium where the fabulous amenities are appointed by the one-and-only Mike Niven. Residents will have access to party lounges, dining rooms, yoga areas, fitness rooms, international gourmet kitchen, boxing studio, technology lounges, guest suites, wraparound barbecue terraces, glass pool lounges with a bar and endless views of the city. Mike Niven also designed the cabinetry for the kitchens in these suites, which include a European-style appliance package and rich quartz countertops. E Condos is the brainchild of Bazis, Metropia Urban Landscapes and RioCan, which operates the Yonge Eglinton Centre across the street – also accessible through the underground retail concourse. And if that’s not enough, this condominium will feature high-end retail venues at its base. This residence’s exterior by renowned architect Rosario Varacalli will be positively stunning. The community’s two towers will have a cantilevered glass-enclosed pool extending out from the 31st level – a first for Toronto. 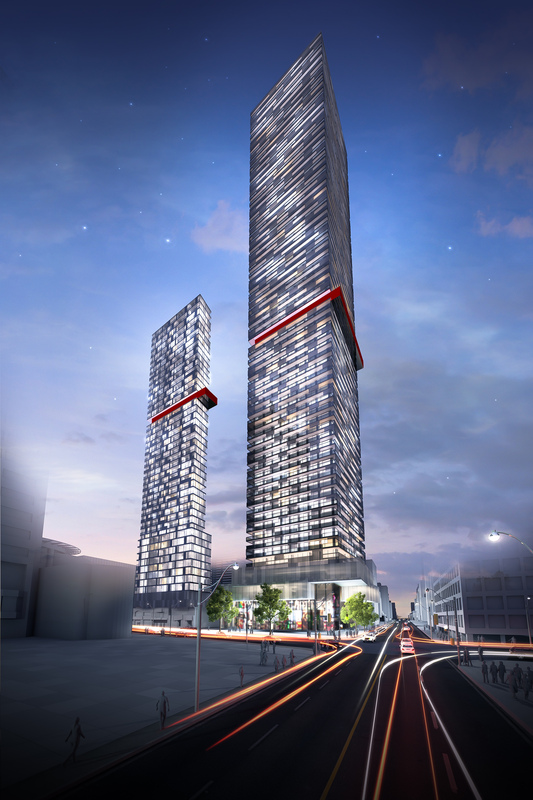 Destined to become an area icon, E Condos is bringing an exciting new vibrancy to Yonge and Eglinton! Anyone interested in this phenomenal opportunity should register NOW at www.econdos.ca.